The pictured item is 15 inches high. I share the opinion that it is a claret jug. I'm definitely in the absinthe camp ! 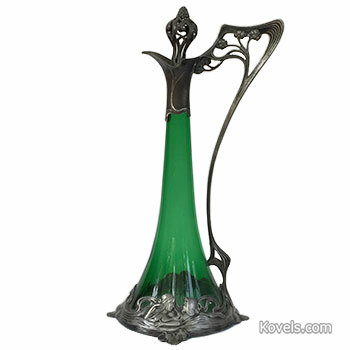 It's a claret jug – German, green glass, Britannia metal, used to hold and serve claret (wine). Gorgeous! I'm in the Absinthe decanter camp! Since it the glass is green it is probably associated with the garden, Therefore, it is a salad dressing pitcher.